Team Suzuki Press Office – July 22. 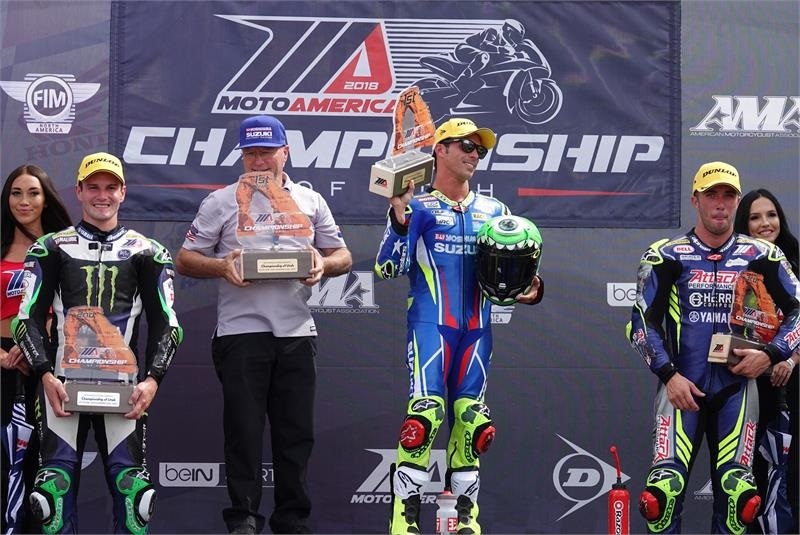 Yoshimura Suzuki Factory Racing’s Toni Elias scored a come-from-behind victory on Saturday in the MotoAmerica Superbike Championship at Utah Motorsports Complex, marking the 200th win for Suzuki in the MotoAmerica/ AMA Superbike Championship. • At Laguna Seca in 1977, Steve McLaughlin gave Suzuki its first AMA Superbike victory. McLaughlin was on a Yoshimura Suzuki GS750-based machine. • Aaron Yates scored the 50th Suzuki Superbike win aboard a Yoshimura Suzuki GSX-R1000 in Road Atlanta race one in May of 2003. • The honor of the milestone 100th win for Suzuki went to Ben Spies in Fontana race one in 2007. • Blake Young took victory in race two at Road Atlanta in 2010 for Suzuki’s 150th AMA Superbike win. • Yoshimura Suzuki has won all but five of the Suzuki MotoAmerica/AMA Superbike wins. Jake Zemke (Jordan Suzuki), Martin Cardenas (M4 Suzuki), John Bettencourt (Yoshimura East) and Roger Hayden (Jordan Suzuki) were the only four riders in the 42-year history of MotoAmerica/AMA Superbike to win on non-factory Suzuki race bikes.